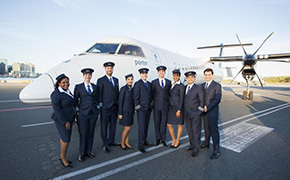 Porter Airlines is significantly investing in Thunder Bay, Ont., adding flights and officially opening a new crew base for pilots and flight attendants. The base grand opening received an added dose of excitement when the airline announced that it is increasing its schedule, with up to seven daily roundtrip flights to Billy Bishop Toronto City Airport. There will be as many as 45 weekly flights, beginning 12APR. Twenty crew members are already established at the base and will begin operating flights this week. They represent a variety of backgrounds, including Porter team members transferring from other bases, crew with previous aviation experience already living in the city and those moving from other locations in Canada. A total of 40 crew members will eventually be located in YQT as hiring and training progresses during the year. PD says it’s the first crew base in Northern Ontario for any large commercially-scheduled airline.